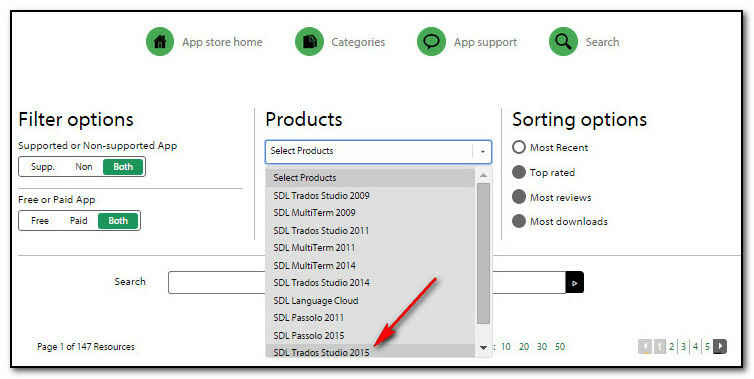 If you installed OpenExchange apps in SDL Trados Studio 2014, you’ll be wondering if they’ll work in Studio 2015. Some will, some won’t and some aren’t even necessary any more. Symbols. You’ll find this feature on the Advanced tab. Bookmarks. Access bookmark settings on the Home tab when you’re in the Projects or Files view, or on the Advanced tab when you’re in the Editor. AnyTM. Use AnyTM to add translation memories with different languages, different language variants and reversed language direction in the same project. To add these TMs to general options, go to File>Options>Language Pairs>Translation Memory and Automated Translation. In the right-hand pane, click Add and select AnyTM. For all other apps, go to the OpenExchange and download the updated apps for Studio 2015. Right now (August 2015), 38 apps have been updated, including the ApSIC XBench plug-in, Glossary Converter, SDLXLIFF Toolkit, SDL Number Verifier and Web Lookup. If you’re looking for a specific app that isn’t in the 2015 list, navigate to the Studio 2014 version, click on ‘Support and Developer Contact’ and ask the developer if a 2015 version is in the pipeline. As a last resort, you’ll find that some of your Studio 2014 apps will still work. This is more likely if you’ve still got Studio 2014 installed on your computer. Bear in mind that OpenExchange apps fall into two categories: plug-ins, which work inside Studio (e.g. Glossary Plugin) and standalone apps, which work independently (e.g. PackageReader). An example of a 2014 plug-in that will work in Studio 2015 is Regex Match AutoSuggest Provider. But you’ll need to have both Studio versions installed on your computer. Most standalone apps will work with old and new Studio versions alike. If your favourite app hasn’t been officially updated, just give the old version a go. It may well work. Examples of standalone apps from Studio 2014 that will also work with Studio 2015 are PackageReader, SDLXliff2Tmx and SDLTmFindVars. This entry was posted in 2. Beyond the Basics, SDL Trados Studio and tagged Open Exchange, SDL, SDL Trados Studio, Studio, Studio 2014, Studio 2015, Trados. Bookmark the permalink.